Congratulations to Ashley Ruel. 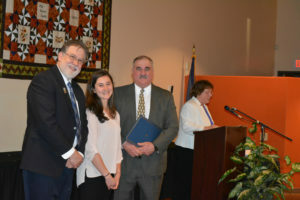 A BHS senior, she was recognized as the BRCOT Student of the Year at the annual MACTE Student of the Year ceremony Saturday night. Senator Brian Langley and Don Canaan, Executive Director of the MACTE are in the picture. Ashlin is a Medical Science student at COT and will pursue a degree in nursing at the University of Southern Maine.